With his-and-hers DIY specialties, the talented couple behind Picardy Project are a match made in home improvement heaven. 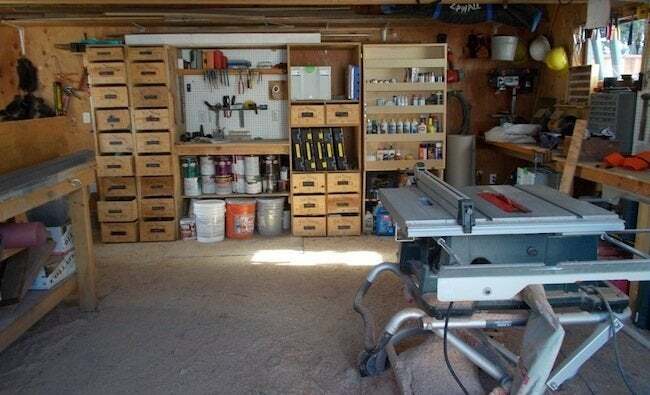 “It’s Chris’s shop that I also use,” says Meryl Phillips describing the 20’ x 20’ garage work space that she and her boyfriend Chris Miller share in Oakland, CA. Meryl and Chris have been going out for seven years and renovating their house for four. On the Picardy Project blog, Meryl documents every change she and Chris are making to the c. 1926 Storybook house, and almost every project requires some maneuvering through their well-equipped garage. It wasn’t always a nice place to work. In fact, when they moved into the house in 2009, the garage was in precarious condition. They attempted to repair it themselves but soon realized the problem was over their heads. “We love DIY,” says Meryl, “but it’s important to understand what is out of one’s range.” Professional engineers came to fortify the structure, and $7,000 later (this reflects a reduced rate since Meryl and Chris pitched in and helped), the romantic renovators had a sturdy, plumb, earthquake-proof and re-roofed space. Now structurally sound, the work space is stocked and organized. It isn’t heated, because it never gets that cold in Oakland, but it is wired, so the couple can work at night and listen to their favorite NPR podcasts, such as “Wait, Wait Don’t Tell Me.” Since Chris and Meryl both work day jobs, renovation projects happen after hours, weekends, and during vacations. Meryl, who minds the replay machine among other duties for the Oakland A’s, is most productive in the winter, when baseball season is over. Meryl and Chris DIY-ed their workshop, outfitting the 400-square-foot, sawdust-covered space with hanging lumber storage, a pegboard wall, and plenty of shelves and usable surfaces. The most unique part of their storage system is a wall unit made from repurposed wooden wine boxes. Chalkboard labels on the front of each box ensure that every hand tool and paintbrush goes back in its proper place. “We have learned the value of having the right tools,” says Chris, who has been collecting the necessary implements for renovation. 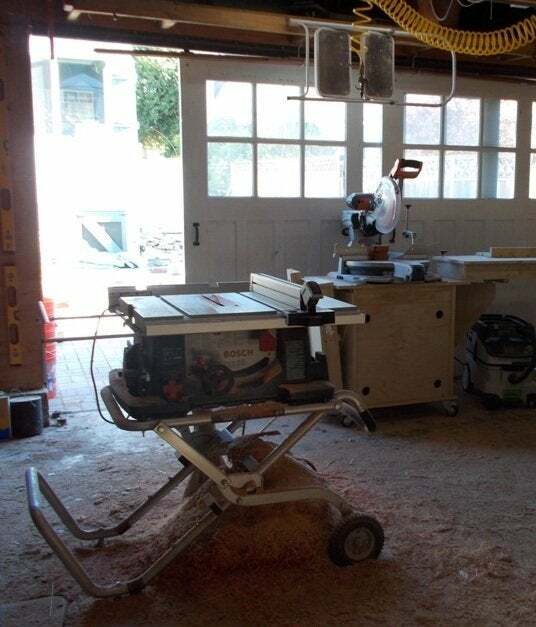 For large projects (rebuilding a corner of the house) to smaller projects (hanging window treatments), the renovators are equipped with every saw and drill imaginable. Meryl prefers miter and radial saws. Her dad showed her how to use the latter early on. He is the one who introduced her to the wonderful world of home improvement. She tells of his messy and disorganized workshop and how she feels compelled to organize it for him, but has refrained, since he insists he knows where everything is. Chris helped his mom with things around the house and remembers watching endless episodes of “This Old House” when he was younger. He has always liked figuring things out and signed up for classes in carpentry and electric at the community college, worked in a paint store and tile center, and reads extensively on the subject. He subscribes to Fine Home Building and Family Handyman and recommends Michael Litchfield’s Renovation for any DIYer’s library. Meryl and Chris met innocently in a record store and have chosen to plunge into the dirty world of DIY together. Recently back from their Renovation Road Trip, Meryl explains their secret to not breaking up: They know what each other’s strengths and weaknesses are and work accordingly. While Meryl favors the design end, Chris likes building it and figuring it out. She says, “The biggest thing is relinquishing control when you know you’re not the one who knows more. Chris might roll his eyes at a design idea I have, he’ll raise concern…but in the end he knows I’ve got a clear vision… and then he’ll realize that I was right.” A sense of humor, of course, is always a good thing too.